The Carnotaurus (kahrn-uh-TAWR-us), or simply Carno, is a species of Dinosaur in ARK: Survival Evolved. Carnotaurus pressor is a distinctive creature that falls between a medium and large predator. It lives primarily on flat, clear ground, where it can capitalize on its speed. Additionally, it seems to have no qualms about running away from larger predators instead of fighting. The horns of the Carnotaurus seem to be used more for fighting rivals than actual hunting. This doesn't mean the horns aren't dangerous, though. They can still eviscerate larger prey. Carnotaurus is one of the smaller and more compact of the large predators. If Tyrannosaurus is the “lion” of the Island, Carnotaurus would certainly be the “cheetah.” The real threat of a Carnotaurus is not being able to escape it once it has spotted you. Carnotaurus fills a very specific role. Larger and almost as fast as a Raptor, smaller but much faster than a Rex. Were it not for the creature's extremely long down-time after sprinting, it might be among the most capably balanced mounts. They will attack anything on sight, and have a fairly large aggravation range. However, they seem to prioritize other dinosaurs over humans. Their headbutt attack will throw the person backwards, potentially off of a cliff. 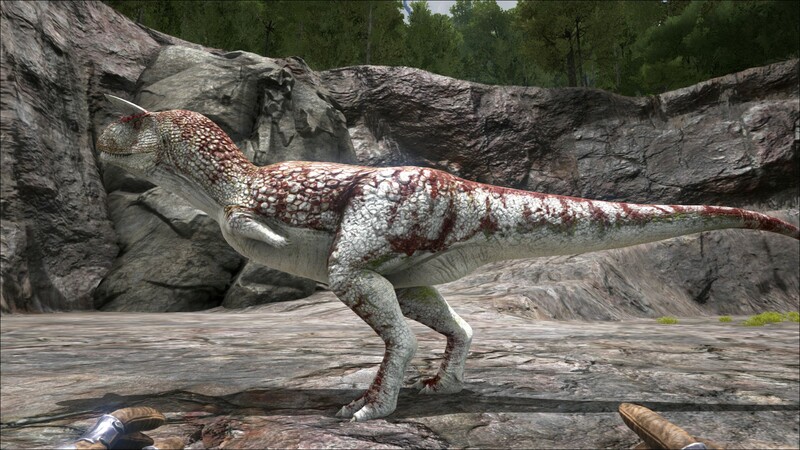 Carnotaurus can be seen in groups of 3 following a wild Yutyrannus in the winter biome. The Carnotaurus is a mid-sized theropod somewhat like a smaller Tyrannosaurus in terms of shape. It does have several distinct features though; the most notable are a blunt head with two forward-facing horns and arms so stubby they make those of a Tyrannosaurus seem well developed in comparison. This section displays the Carnotaurus's natural colors and regions. For demonstration, the regions below are colored red over an albino Carnotaurus. The colored squares shown underneath each region's description are the colors that the Carnotaurus will randomly spawn with to provide an overall range of its natural color scheme. Hover your cursor over a color to display its name and ID. 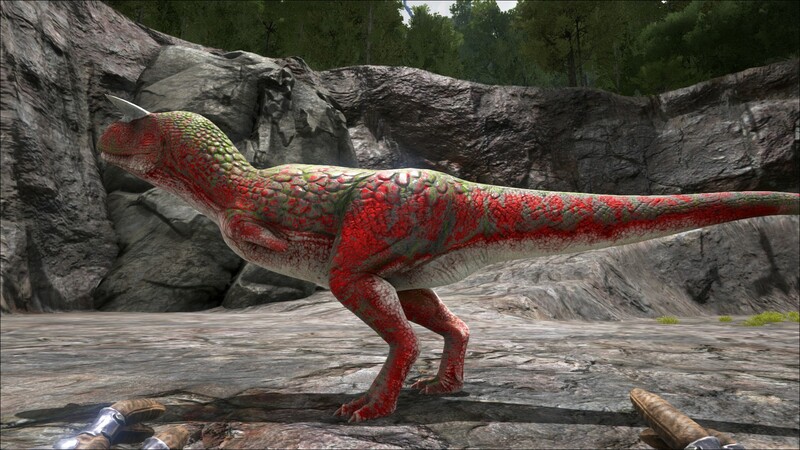 For example, "cheat SetTargetDinoColor 0 6" would color the Carnotaurus's "body" magenta. 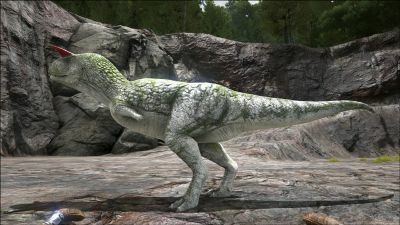 Using the (PC), (PS4), (Xbox One), the Carno bites the target. Using the (PC), (PS4), (Xbox One), the Carno headbutts the target causing considerable knock-back. Be careful when confronting a Carno. They are powerful and will gang up on you. Often, the best method would be using a Scorpion and/or Tranquilizer Arrows, but it can be done with other methods of applying torpor, albeit at a greater risk. An easy way to keep a carno at a good enough range to hit it safely with tranquilizers is to build a wall three wide and three tall on fence foundations with two doorways stacked on top of eachother with no doors to shoot through. Then, aggro the carno and lead it to the wall. Then run through the door way to get it stuck and proceed to KO it. This section describes how to fight against the Carnotaurus. The Carno is one of the island's mid-sized predators. While smaller than a Rex, it can be very deadly. Its medium speed causes it to be a quite deadly predator, but can be killed at a distance with a ranged weapon. If approached with a melee weapon, the Carno can pose a notable threat to an unprepared survivor. It can knock a player back and charge once more. Attempt to avoid unless the player is confident it can take the Carno successfully. Be sure there aren't any other Carnos or other creatures in the area that can turn the battle against you. Also, make sure the Carno is not glowing red. If it is, that's an Alpha Carno! The Carno has a powerful head-butting attack, if not careful the player could fall from a high point, either to instant death or to slaughter by other animals. When tamed you can employ this tactic on prey and other creatures. It is a powerful advantage over Raptors and other animals, which do relatively no knockback. Until then, use spears and pikes to out-distance it, or use ranged weapons like guns or bows. Make sure that the battle consists of just you and the Carno. Any decent level small-mid sized carnivore will do to fight it as they don't have a lot of health. Make sure you aren't near a cliff while fighting as it has immense knockback on a player on foot. It is worth noting that Yutyrannus minions react as one. Attack one, and they will all engage. The Carno is a secondary-size predator, so it can be killed relatively easily, provided the player can take what it throws back. The Carno has a rather loud and distinctive movement sound, which may give you an advantage when preparing for an engagement. Note that their hit boxes are rather large, and striking them with most weapons is relatively easy. Leech Hunter: Due to its head being far from its legs, leeches have trouble attaching to a Carnotaurus. They make excellent hunters, just be mindful of larger swamp predators! It is recommended to use third person while hunting, so you can see the leeches without the Carno's head blocking your view. Meganuera Hunter: Being able to swat them out of the sky with one blow of its massive head, Carnos make excellent bug hunters. Cave Hunter: This creature is probably one of the best creatures in ARK to explore the many caves. It can fit in most of the entrances and can get to the artifact quickly and effectively (Level up Melee Damage and Health). The Carnotaurus illustrations in the dossier are shown with longer arms than the ones in-game, which are accurately portrayed with stubby forelimbs that lay flush against the body. Presumably, this may have been a drawing error by the author. The general portrayal of the Carnotaurus shows longer arms and a shorter, wider head, much like the Carnotaurus from the Disney movie Dinosaurs. It's possible that Carnotaurs were meant to look like this but the model ended up being made more accurate. As it stands, the Carnotaurus currently has the most accurate model compared to its real life counterpart, the only difference being that it is larger. The Carnotaurus's name translates from Latin into "meat-eating bull". The Carnotaurus's speed in game is justified; examination of the flexibility of the hip and tail structures of fossils indicate that the Carnotaurus may have been one of, if not the, fastest large theropod. However, it could not make turns very well due to the rigid structure of its chest and spine. Despite the Carnotaurus's Dossier stating that it is "much faster than a Tyrannosaurus", in-game, the average wild Rex actually has roughly equivalent sprinting speed, faster walking speed, but less stamina when compared the average wild Carno. The stats for a tamed Carno versus a tamed Rex are very different; a tamed Rex is actually considerably faster in a sprint than a tamed Carno, and while a Carno's stamina will last longer, it also takes much longer to recover. Do not necessarily expect your tamed Carno to leave a hostile tribe's tamed Rex behind. Can be picked up by a Quetzal. The Carnotaurus is one of the few dinos whose base color regions include a color other than white (the green markings near its legs and along its back). This makes it so the Carnotaurus always appears to have green stripes, even if Color Region 4 would be different. Bred Carnos with Imprinting can become very powerful and able to take on wild Rexes and Alpha Raptors, even lower level Alpha Carnos. They are relatively quick to grow up (around 48 hours) making imprinting easier to achieve compared to Rexes that take around twice the time to grow up. They also spawn in great numbers and are easier to knock out than Rexes so finding good breeding material is often easier. Can be found very commonly in the southern high desert atop the mountain in Scorched Earth. The name "Carnotaurus Pressor" translates into "Crusher Meat Eating Bull"
If you have a good weapon (journeyman sword) it is possible to catch a low level carno of guard and easily kill it. 1st person view when riding.